The Shire Abri Apex Shed is one of the more attractive buildings on the market. Its slight roof overhang doesn’t just look good, it also adds to the weatherproof benefits of the shed. Apex roofs are renowned for their defence against rainwater, but the overhang on this one ensures that as the rain runs down the roof, it runs right onto the ground, rather than down the front of the building. The glass opening window on the front of the shed is another stylish feature. Windows are often located on the sides of a shed, rather than the front. The benefit of front-facing windows isn’t just aesthetic, it’s practical too. More light is able to filter into the building and ventilation will also be better too. The Shiplap tongue and groove walls give it a durable and smooth finish. Even the floor comes with a tough tongue and groove design. 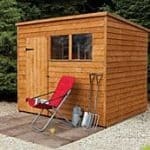 It is perfect as a strong storage shed or even a small hobby room. The offset single door has a wide design and is also hinged for stability. 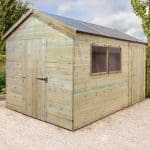 If you’re looking for a garden shed that has style as well as plenty of practical benefits then this is a great model to invest in. Roof felt quality is very basic, though it does provide adequate protection. This isn’t just an average storage shed. The Shire Abri is a beautiful looking building with great character. It looks more like a playhouse than a storage shed. What’s really interesting about the shed’s measurements is the height of the door. You didn’t misread it – in height it measures just 5’3”. This makes it a particularly great choice if you’re fairly short, but if you’re 6’1” you may find it a bit of a problem! However, thanks to the tall apex roof, the interior of the building is a little more spacious. No matter how tall you are you should find it comfortable to manoeuvre around inside. The door is also wider than average so you can get bulky items in and out with no problems. One of the main focal points on this shed is its roof. Whilst the apex design isn’t unique, the overhang at the front is. It gives the building a different style to most of its competitors and also provides a more practical weatherproof benefit. Rain will not easily be able to get onto the front the shed; instead it will drop right onto the floor. Apex roofs are widely used by manufacturers because they also supply a great deal of interior height. This is all down to the upside down V shape; allowing more height through the central part of the building. It comes complete with a basic felt covering for extra water resistance. It is made from standard solid sheet materials which we always find provides brilliant support for the roof. However if you feel it is necessary, you can also add a few roof joists. It’s the floor we really like with this shed. Unlike the roof, it benefits from tongue and groove. This makes it a lot stronger and therefore capable of being used for heavy equipment or machinery. It is for this reason it could also be used as a small workshop or hobby room. Excellent quality planed softwood has been used to construct the Shiplap tongue and groove walls of this shed. This gives it a bright, chic design that sets it apart from many other similar sheds. You can tell a Shiplap clad building just by looking at it. As you can see from the photo, every timber panel has a thick, distinctive look. It has a much smoother finish than overlap and comes with a built in water-resistant channel that helps to protect against both fungus and rot. This style of cladding is also a lot easier to install. Tongue and groove is also seen on laminate floors and it helps to speed up installation as each panel just slots neatly into place. 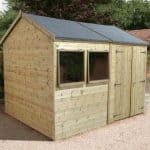 It also creates a super tight interlocking design, making the walls of this shed resistant to high winds as well as rain. Inside the shed you’ll find another impressive feature – the 35mm x 35mm framing. This is a lot thicker than average and gives the exterior structure a stable and secure support. The manufacturer has given the timber a water based honey brown treatment prior to shipping it out. This high quality pre-treatment means you don’t have to worry about treating the building again for around 3 months after assembly. After the 3 month treatment, it is advised to re-apply a high quality treatment every year. The single door on this shed has a very chic design. Compared to the majority of doors found on same sized sheds, this has a very short design. At just 5’3”, it really does make the building appear more like a tiny summerhouse or playhouse. Though it does have a very wide design so getting anything bulky into the shed is going to be really easy. The door is also offset towards the side of the building to allow the placement of the window at the front. There is a pad bolt secured to the door and it is also fully hinged for great sag prevention. The criss-cross morticed and tenoned opening glass window also adds to the shed’s more unique design. It comes with mitred profile beading which means you don’t have to worry about awkward cutting. As it opens, the shed benefits from ventilation when needed and the frontal location also provides more light into the building than a side window would. A fairly simple pad bolt is attached to the door which allows the addition of a padlock. 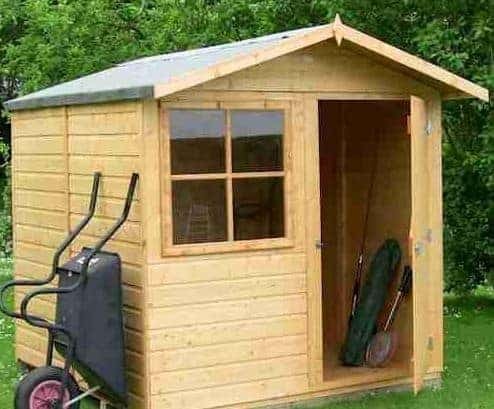 There is no padlock supplied with the shed so the security isn’t great. The large window could also pose an issue as potential burglars will be able to see exactly what you are storing. However, the good news is you could install curtains to cover the window whilst you aren’t using the shed. Not only would this enhance its privacy, but it will also deter thieves from trying to break in as they won’t be able to see what’s inside. A Wooden Base with Adjustable Spikes is your only additional option. Though to be fair it is a very vital extra as it really helps to anchor the shed, making it much more secure. The spikes are pretty long and they fit deep into the ground to ensure it is incredibly stable and supportive. 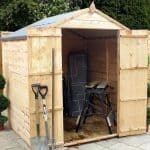 The one supplied here is slightly bigger than the actual shed at 7’ x 7’, so that also helps as there is plenty of space to assemble the building. The fact there’s just one extra on offer here isn’t overly surprising as it comes with a pretty great design. However, we would have liked to have seen a padlock offered. Shed Store do supply them so it’s strange they don’t give you the option to add one with your purchase. We highly recommend buying a padlock as the pad bolt attached to the door won’t be much of a barrier for anyone to gain access to the building. This is one of our favourite Shire models and it benefits from an extremely high quality design. It isn’t just the great quality materials used for construction, it’s also the way the shed looks. It is unique and really stands out from the crowd. 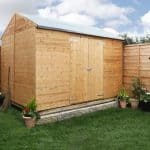 As even the floor is constructed with tongue and groove, this is a very long lasting, durable shed. It does require annual treatments but if you follow the maintenance guidelines you can be sure it will withstand any weather. This isn’t the largest shed on the market and it does have a fairly small design compared to similar sized buildings. This is especially true when you take into account the very short door. Getting tall tools or equipment into the shed isn’t going to be easy. However, you can add pretty heavy shelving to the interior walls which does give you more storage options. A leaflet is provided to help with installation, but it isn’t overly clear. The text may be a little hard to read and the pictures are a little confusing. However, estimated assembly time is 2-4 hours which is really good for this size building. With its very unusual yet attractive design, you are getting excellent value with this building. It comes with quite a few great features and despite the small door and slightly tricky installation, it really is an incredible building. Final Thoughts: One of the more stand-out sheds on the market, the Shire Abri Apex Shed is armed with all kinds of useful benefits. 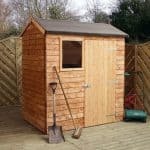 The tongue and groove floor is one of the more beneficial features as it allows you to store very heavy equipment and also highlights the overall quality of the shed. The roof overhang at the front of the building is also unique and it provides excellent additional protection against the elements. There is a forward facing opening window, though as it comes with interchangeable sides, you can choose to move this to the side if preferred. Overall this is a very chic looking building that you’re guaranteed to love.